HEROLAB says it is well known for making centrifuges, but less well known for wide range of centrifuge tubes and bottles. The company says its Centrifuge Labware guide gives extensive information on product selection information, and contains valuable information for anyone working with centrifuges. Herolab says its expert team can help guide customers to the right product while offering “some of the most competitive prices on the market”. The labware catalogue gives a great deal of information about the consumables that are available, and further information can be found via the ‘virtual advisor’ on the Herolab website. There are many factors that influence the performance characteristics and lifespan of centrifuge consumables. Herolab says it has endeavoured to produce, within reason, high quality products to meet the demands found under most laboratory conditions. The company acknowledges that the large number of applications and techniques in use in laboratories means there is no one single perfect material for all centrifuge tubes. What may work well for one application may not be so good for another. It says though that its range of consumables gives the use a wide choice when selecting a tube or bottle. 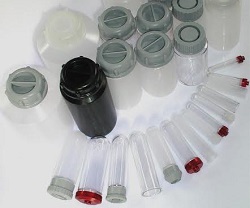 All tubes and bottles come with screw caps which are gas and leak proof under high centrifugal force.